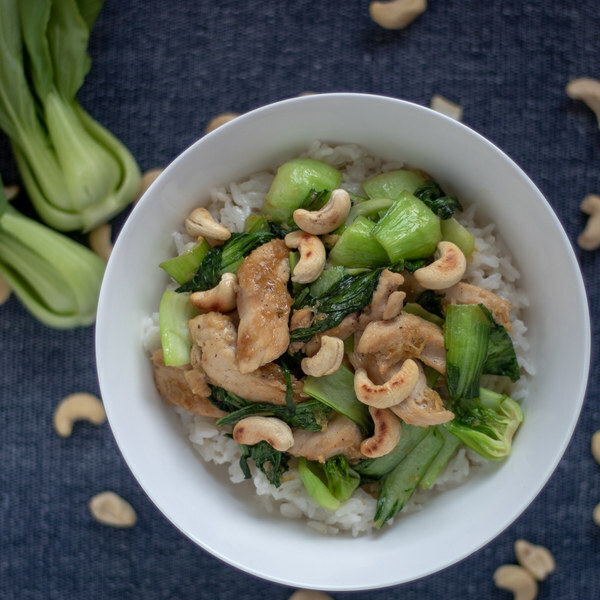 ← Teriyaki Chicken with Bok Choy, Cashews & Coconut Rice. Heat a medium saucepan over high heat. Add coconut milk, water, and salt and bring to a boil. Once the liquid comes to a boil, stir in the rice, and reduce the heat to low. Cover and cook until the rice is tender and all liquid has been absorbed, about 12 minutes. Peel and mince the garlic. Peel and mince or grate the ginger. In a medium bowl, create a slurry by whisking together water and cornstarch until smooth. Add soy sauce, honey, and the minced garlic and ginger to make the teriyaki sauce. Cut the chicken into bite-sized pieces. Season with salt and pepper. Once the skillet is hot, add coconut oil and swirl to coat the bottom. Add the chicken and cook until browned and cooked through, 4-5 minutes. Wash bok choy, trim ends, and chop into 1-inch pieces. Add the bok choy to the skillet; cook, tossing frequently, until the bok choy is wilted and tender, 2-4 minutes. Add the teriyaki sauce. Cook, stirring often, until the sauce is slightly thickened, 2-3 minutes. To serve, divide the rice between bowls, top with the stir fry, and sprinkle with cashews. Enjoy!